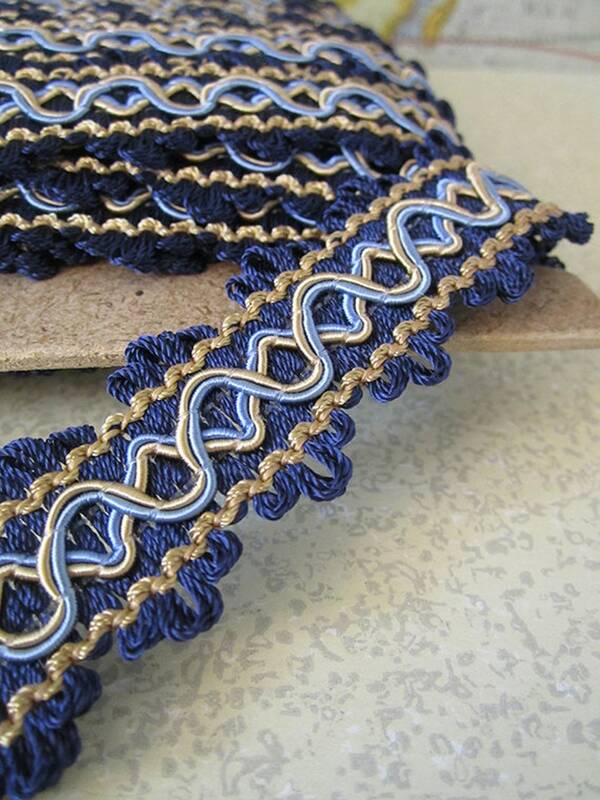 This listing is for 3 yards of a lovely, loop woven trim that creates a scalloped edge and features a gimp two-tone scroll in light blue and tan on a background of navy blue and tan. Remnant - last piece of the bolt - measures 3 yards 8 inches. note: other colors are available. The trim is prettier than what picture shows. I wish I could order more yardage. Beautiful trim. I haven't used it yet but I do have a project in mind. Good experience with this dealer. Purchase may be made through Pay Pal account or Direct Checkout. Payment is expected at the time of purchase. Your order will be shipped upon verification of funds received. Sales tax on orders within California will be added to the purchase price. Providing a pleasant shopping experience for you is my number one priority and every effort will be made to resolve any issue. If there is an issue, don't panic. Just contact me and I will be happy to find a resolution right away. Prompt communication via Etsy conversation is the key to determining the best solution to any concern. Please send an Etsy conversation regarding any concern within 48 hours of receiving your order along with photos, if necessary. If an item is returned, it must be received without damage or use. In general, returns should be avoided with upfront communication regarding any questions or concerns prior to placing order. Order will be shipped to Pay Pal or Direct Checkout address unless otherwise notified. Items will be shipped within 1-3 business days after receipt of cleared payment. Please indicate if a "rush" order is needed and every effort will be made to ship quickly. Orders are shipped in new packaging via USPS. International shipping of items is not currently available. Vintage items may show signs of age and or use. Feedback is greatly appreciated. Please contact me prior to leaving neutral or negative feedback for the opportunity to resolve any issue. Please reference all photos along with description for most accurate and best representation of any item. Contact me for any concern or question prior to ordering. New items are added frequently, so please check back for the latest addition of treasures!